Bernards’ paper examines the political innovations that have increased bicycling rates in cities across the country. By exploring the history of bicycling advocacy in community groups and city halls, particularly in Portland, OR, Bernards finds that effective policies stem from critical and disruptive dissent. He draws upon the radical history of the bicycle, bicycling advocacy and the meaning of urban-mobility to show how cycling is an expression of demand for public space and is “a new form of the commons.” The paper shows how everyday, subversive and intentional behavior can cause policy change. Bernards, a political studies major who has served as a student member of Pitzer’s Academic Planning Committee, was named a 2013 Robert Day Scholar. 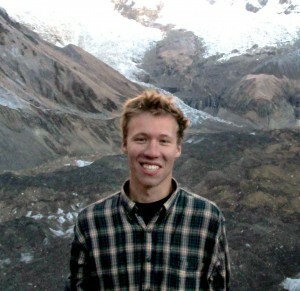 He also won a Benjamin A. Gilman International Scholarship to spend fall 2012 on the Pitzer in Nepal program, where he studied rural tourism development and international aid projects along the Great Himalayan Trail. The Library Undergraduate Research Award recognizes the importance of a scholar’s research journey from initial idea to final destination and celebrates the undergraduate research process.